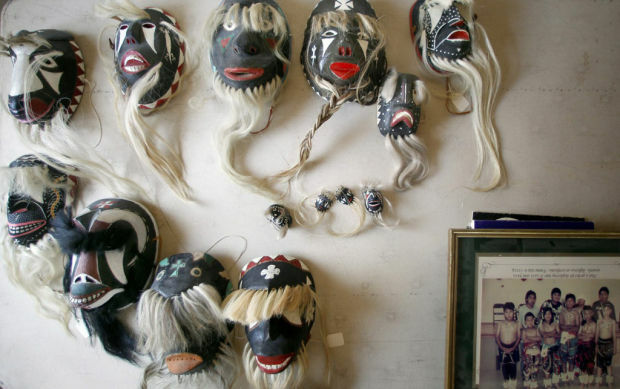 Tribal masks and old photographs are among the 4,000 artifacts that will be on display at the Old Pascua Museum and Yaqui Cultural Center. For more than 100 years, the history of Old Pascua on Tucson's west side has been preserved orally. Beginning next week, leaders of Tucson's original Yaqui village will welcome tourists and curious residents to a new museum for a peek into the world of tribal customs and history. The San Ignacio Yaqui Council of Old Pascua Village will hold a grand opening today at the museum, 856 W. Calle Santa Ana, near Grant Road and Interstate 10. Oil paintings, photographs, ceremonial masks and documentary videos will be available for public viewing, said Guillermo "Bill" Quiroga, the museum's director. There will be more than 4,000 artifacts on display, and mini-ceremonial masks, Yaqui rosaries and other items will be on sale in the gift shop. Yaqui artists who live in Sonora will also have space available to sell their artwork on consignment. Quiroga said the 400-square-foot museum was originally a home built in the 1920s and willed to the tribe when the owner died. It is one of the earliest residences of Old Pascua and listed on the National Register of Historic Places. There has always been curiosity about Yaqui traditions, especially the Easter celebration in which deer dancers and masked men participate in religious ceremonies with elaborate costumes and rituals. "Our museum will focus on those cultural traditions and educate the public," Quiroga said. From acquiring the property to getting a historic preservation grant from the city of Tucson, the museum was 13 years in the making. Old Pascua was the original settlement for tribal members who fled persecution in Mexico in the early 1900s. Refugees settled along the Santa Cruz River, then relocated to Old Pascua on land set aside by a benefactor. The San Ignacio Chapel was built there, and tribal members were free to practice their centuries-old traditions. While most registered tribal members now live in "New Pascua" on the city's southwest side, about 500 members remain in Old Pascua, tribal data show. There are about 20,000 registered Yaqui members in the United States; 8,400 are in Pima County and 7,100 in Maricopa County. In Sonora, there are about 70,000 Yaquis, said Francisco Valencia, vice president of the San Ignacio Community Council and a ceremonial captain. Growing up in Old Pascua, Valencia said, he longed to see a museum on neighborhood history. "It's a great and overdue project," he said. "Councils in the past had planned a museum, but we'd never been able to finish it." Tribal Chairman Peter Yucupicio was born in Old Pascua and still lives there with his family. "There is much pride in the traditions we hold in Old Pascua," he said. "It's beautiful now that we have a museum to highlight those things." Yucupicio hopes the new museum will grow into a bigger space. "I'm so proud and happy that the San Ignacio Council spearheaded this," he said. "They've done a wonderful job, and I look forward to seeing it flourish." • What: Grand opening of the Old Pascua Museum and Yaqui Cultural Center festivities. • When: 10 a.m. to 6 p.m. today. • Where: 856 W. Calle Santa Ana, south of Grant Road and Fairview Avenue. • Regular hours: Museum will open Tuesdays through Saturdays from 9 a.m. to 1 p.m., beginning next week. • Cost: Free, but donations welcome.